Best Countries for Street Food in The World! For many, street food often epitomizes a country. Food represents culture, socializing and family and for a traveler it can be new, exciting and open whole new worlds of mouth-watering cuisine. Amazing street food can be found all across the world, from exotic Thai street vendors selling mysterious delicacies (bugs included!) to Mexican tlacoyos or Brazilian Feijoada. Check out these 3 top countries for street food! Delicious, plentiful and cheap, street vendors can be found on practically every street corner in Thailand, with the street food capital obviously being Bangkok. Mostly found for under $5 for an entire meal, Thai street food is great for those traveling on a budget as it’s filling and healthy for the most part. Much of the best street food in Bangkok can can be found in Chinatown, Silom Road and Banglamphu. There are an almost infinite choice of hotels in Bangkok as it’s actually the most visited city in the world, so you won’t find any problem finding a place to enter your food coma next to any of the aforementioned street food hot spots. 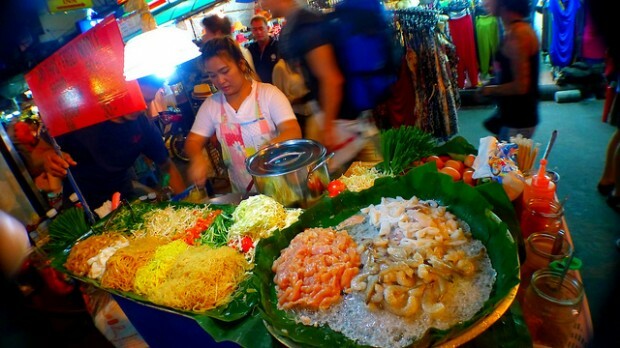 A stapleThai streetfood, pad thai noodles are mixed with various vegetables, meats or fish. Travelers can customize pad thai as much as they wish and will need to decide whether they want their noodles ‘naam’ (with soup) or ‘haeng’) (dry). The pad thai noodles then need to be flavored using either sugar, chili, fish sauce, vinegar with chili and/or peanuts. Crispy with a moist, melt in the mouth, center oyster omelets are one of the most popular choices of street food among travelers in Thailand. At less than $2, it’s no surprise that many travelers chose them as an in-between meal snack! Pad thai and Hoi Todd are just the tip of the iceberg when it comes to delicious Thai street food. Don’t miss spicy papaya salad or the fantastic fresh fruit either! 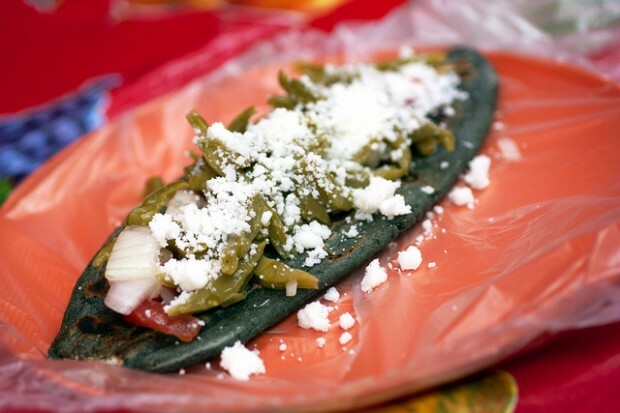 A popular street food among both locals and tourists, tlacoyos are sold by almost every vendor in Mexico City. Tacoyos are A corn patty and at their best fresh off the grill topped with various Mexican delights such as sour cream, salsa and refried beans. Serving delicious sweet potato treats to hungry locals and keen backpackers, Camotes vendors, while portable can be heard all across Mexico City thanks to the piercing whistle produced from the pressure cooker expelling steam while cooking the sweet potato indulgence. Usually eaten as a desert, camotes are often served with cream and fruit marmalade. Traditionally filled with meat, there are numerous fillings and types of tamales that can be found throughout Mexico City. The best ones are often found cooked within banana leaves trapping the juices creating delectable tamales’. Served with peppers, garlic and rice, Feijoada is a popular Brazilian dish made with black beans, especially loved in Rio de Janeiro. 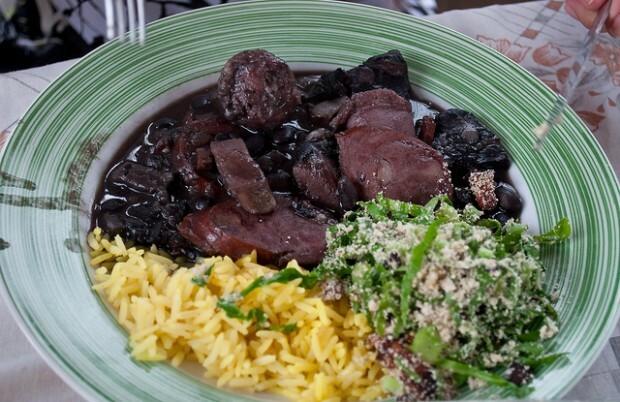 Encompassing all aspects of Brazilian cooking, a Feijoada is a bean dish mixed with various meats, often from pigs or cows. Similar to tamales, Brazilian pamonhas can either be sweet or savory. Made from corn, this popular street food is boiled in water inside a wrapper. Savory pamonhas are often filled with meat and stuffing, whereas the sweeter versions use coconut milk for flavoring. Similar to the Cornish pasty, the empadinha is a mixture of seasoned meat and vegetables filled into dough before baking. A Brazilian empadinha has traditional South American filling such as shrimp, chicken, vegetables or palm hearts. Often found near the beach, empadinhas are a fulfilling snack enjoyed by Brazilians and tourists alike. Where was the best country you visited for street food? Posted in Budget Travel, Mexico, Thailand and tagged with brazil, budget travel, food, Mexico, Thailand. RSS 2.0 feed. 4 Responses to Top 3 Countries for Street Food! That’s what awesome readers like you are for Eduardo, to fill in the gaps for us 😉 Thanks so much for adding to the post! Great List.. I’m a huge fan of Pad Thai.